(Nanowerk News) Many potentially efficient drugs have been created to treat neurological disorders, but they cannot be used in practice. Typically, for a condition such as epilepsy, it is essential to act at exactly the right time and place in the brain. 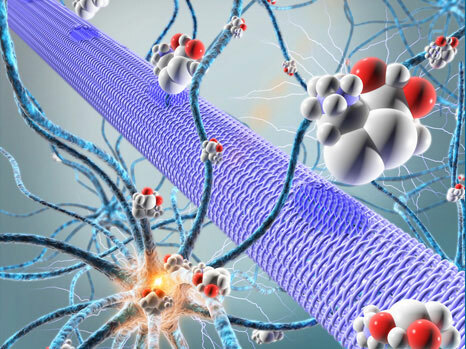 For this reason, the team of researchers led by Christophe Bernard at Inserm Unit 1106, "Institute of Systems Neuroscience" (INS), with the help of scientists at the École des Mines de Saint-Étienne and Linköping University (Sweden) have developed an organic electronic micropump which, when combined with an anticonvulsant drug, enables localised inhibition of epileptic seizure in brain tissue in vitro. This research is published in the journal Advanced Materials ("Controlling Epileptiform Activity with Organic Electronic Ion Pumps"). drugs that succeed in penetrating the brain will act in a non-specific manner, i.e. on healthy regions of the brain, altering their functions. Epilepsy is a typical example of a condition for which many drugs could not be commercialised because of their harmful effects, when they might have been effective for treating patients resistant to conventional treatments . During an epileptic seizure, the nerve cells in a specific area of the brain are suddenly activated in an excessive manner. How can this phenomenon be controlled without affecting healthy brain regions? To answer this question, Christophe Bernard's team, in collaboration with a team led by George Malliaras at the Georges Charpak-Provence Campus of the École des Mines of Saint-Étienne and Swedish scientists led by Magnus Berggren from Linköping University, have developed a biocompatible micropump that makes it possible to deliver therapeutic substances directly to the relevant areas of the brain. The micropump (20 times thinner than a hair) is composed of a membrane known as "cation exchange," i.e., it has negative ions attached to its surface. It thus attracts small positively charged molecules, whether these are ions or drugs. When an electrical current is applied to it, the flow of electrons generated projects the molecules of interest toward the target area. To enable validation of this new technique, the researchers reproduced the hyperexcitability of epileptic neurons in mouse brains in vitro. They then injected GABA, a compound naturally produced in the brain and that inhibits neurons, into this hyperactive region using the micropump. The scientists then observed that the compound not only stopped this abnormal activity in the target region, but, most importantly, did not interfere with the functioning of the neighbouring regions. This technology may thus resolve all the above-mentioned problems, by allowing very localised action, directly in the brain and without peripheral toxicity. "By combining electrodes, such as those used to treat Parkinson's disease, with this micropump, it may be possible to use this technology to treat patients with epilepsy who are resistant to conventional treatments, and those for whom the side-effects are too great," explains Christophe Bernard, Inserm Research Director. Based on these initial results, the researchers are now working to move on to an in vivo animal model and the possibility of combining this high-technology system with the microchip they previously developed in 2013. The device could be embedded and autonomous. The chip would be used to detect the imminent occurrence of a seizure, in order to activate the pump to inject the drug at just the right moment. It may therefore be possible to control brain activity where and when it is needed. In addition to epilepsy, this state-of-the-art technology, combined with existing drugs, offers new opportunities for many brain diseases that remain difficult to treat at this time.